I think the first time I ever had a churro was while I was living in California, during a trip to Disneyland with friends. One churro cost something like $10, but I didn't even care. I was amazed. How could something so delicious have eluded me for so many years? I don't think I'd even heard the word "churro" until I was in my mid-twenties. I started buying churros and mini churros from El Pollo Loco, Jack in the Box, street vendors, and anyplace else I found them. My wife, Sonia, loves churros too. They were a staple in her Southern California diet long before I ever came into the picture. 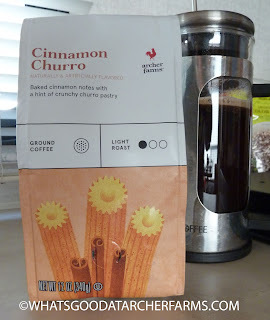 And since she's a churro expert, AND she loves coffee...for the first time ever on this blog, I'm going to let her do most of the reviewing, and I'll defer to her for the product's final score. She liked it overall. She thought it tasted more like just plain cinnamon than an actual churro, but she admitted that there were hints of something churro-esque. It didn't require any more or less sugar than her normal cuppa, but she did make sure to use brown sugar for a more authentic churro-y taste. As you can see from the photo, she brewed the coffee in a French press and was pleased with the results. Overall, it's a pleasant flavor, but there's quite a ways to go until it's unmistakably churro-tastic. Sonia gives this product 7 out of 10 stars.